When is an action camera not a GoPro 7 Videos That Will Make You Want a GoPro Camera [Stuff to Watch] 7 Videos That Will Make You Want a GoPro Camera [Stuff to Watch] Clever marketing goes beyond memorable advertising when it demonstrates exactly what you are missing out on by not owning a product. I'm not usually a sucker for advertising, preferring instead to make my own mind... Read More ? When it’s one of the hundreds of cheaper, readily available imitations that have flooded the market in the wake of the mount-anywhere wide-angle success story Buying a GoPro or Action Camera: 7 Useful Things You Need To Know Buying a GoPro or Action Camera: 7 Useful Things You Need To Know If you're into skiing, cycling or surfing, then an action camera is the perfect way to record your adventures. Read More . 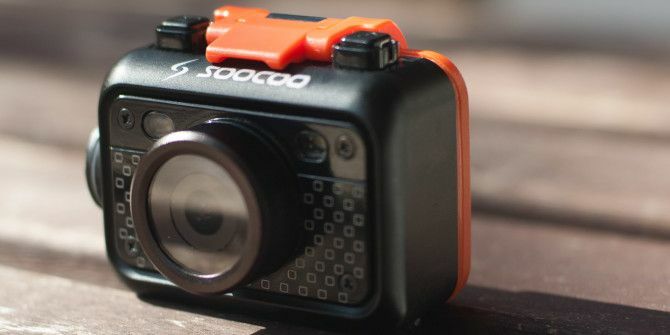 Today we’re looking at the SooCoo S60, a high definition waterproof action camera that costs about a quarter of the price of a GoPro and comes with a good selection of mounting points and a remote trigger you can wear on your wrist. Oh, and of course we’ll be giving one away to a lucky reader, so see how you can enter at the end of the post. The S60 is a wide-angle action camera, also known as a sports camera, and you might even be tempted to call it a dashboard camera considering the current popularity of such devices How to Choose the Right Dashcam for Your Car How to Choose the Right Dashcam for Your Car As you browse dashcams you may wonder why one would be desirable. What features do they offer? How are they different from a regular camera? Why not just use a smartphone? Read More . It’s like a GoPro, except it’s not as polished and has a few of the tell-tale design flaws that cheaper versions of successful products tend to have. It’s also nothing like a GoPro in that it costs about a quarter of the price. A GoPro Hero4 Silver and the newer, smaller GoPro Hero4 Session each cost $399, but you can grab the SooCoo S60 on Amazon for $99. For the cost of one GoPro, you could buy four S60s — though it’s worth noting that both the Hero 4 Silver and Session are a class above the S60 and similar devices. The S60 isn’t the cheapest device out there either — not by a long shot. You can buy super-cheap action cameras on Amazon for around $40, though don’t expect remote control over Wi-Fi, reliable waterproofing or footage worthy of a Red Bull advert Extreme Sports Revealed With Amazing GoPro Videos Extreme Sports Revealed With Amazing GoPro Videos GoPro cameras are designed to be worn or held while doing adventurous activities. They're tough and waterproof, meaning they can survive along with you (hopefully) whether you're jumping out of a plane, diving in the... Read More for that price. 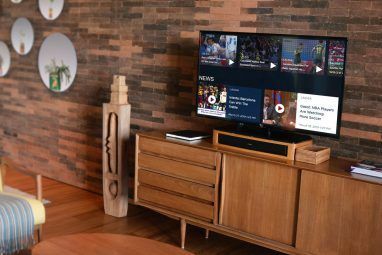 The S60 distinguishes itself from the other imitation GoPro units in that it comes with a wrist-mountable remote control, which allows you to start and stop playback over a Wi-Fi connection. The unit is waterproof to a depth of 60 metres, and even claim that their remote control continues to work at this depth (my bathtub isn’t deep enough to test, I’m afraid). Another quirk to the S60 is that unlike many similar products (including the GoPro), it does not require external housing for its waterproofing. The unit itself is just waterproof, provided you shut the rear battery compartment properly and close the ports using the included seal. The lack of an extra case makes the unit considerably smaller than many of the sports cameras on offer. The S60 is constructed from what feels like heavy, solid plastic though there’s a metal plate on the front of the unit, and the lens barrel itself is also metal (judging by weight, both are probably stainless steel). On the very top of the device are two buttons in the typical “shutter” position, one for power and the other for starting and stopping recording. The back of the unit is made mostly of bright orange rubberized plastic, which is held in place by a heavy plastic clasp under which the battery and memory card lives. There’s also a rather tiny LCD screen on the back of the device (handy for framing your shot) and six rubberized “clicky” buttons for interacting with the menu system. On the front of the unit above either side of the lens are two fairly high-powered LEDs, activated using a button on the back of the unit. On one side of a device is a screw, which provides a waterproof seal to keep the micro-HDMI and micro-USB ports dry. On the bottom you’ll find a universal mount, which unlike a GoPro unit is attached directly to the camera itself. As far as I’m concerned, this is a problem. For starters, it’s the same plastic that is used by the mounts, which is more brittle than you’d hope. I managed to snap one the mounting points for the bike mount just riding around city streets, with no impact (I suspect I slightly overtightened the bolt). I then managed to break the connector for the helmet mount while disconnecting it — the plastic is disappointingly cheap. The mounts on the camera have quite a bit of give in them when squeezed, and they protrude at an awkward angle directly from the camera itself. I suspect if you were to drop the camera from even a moderate height there’s a good chance the mounting points would break and you’d no longer be able to mount it on anything (without superglue surgery, of course). For that reason I can’t say that the S60 is well-built. While the body of the camera is made from durable plastic, the mount and attachments are far less sturdy. The hinged rubberized plastic door on the back feels flimsy and though the all in one design results in a smaller form factor, there’s virtually zero protection for the rear of the unit. The following is a video shot mostly using the handlebar attachment which should give you a good idea of what to expect from the S60. Similarly, the quality of the stills are nothing worth shouting about but probably good enough for a keepsake. Of course, that ultra-wide angle lens has a tendency to warp the world around you, so watch those straight lines. Video framerate seems stable, with little in the way of frame loss even in fairly dark conditions. The lens provides an adequately wide perspective which should show off most of what’s in front of you, whether you’re mountain biking or using the S60 as a dash cam. In favourable conditions, video quality is grainy but good enough — but in the wrong conditions, this isn’t the case. Under such conditions, color and detail become washed out; clarity diminishes and you might find that you’re left with less than adequate footage. A makeshift lens hood may help the situation. The S60 is equipped to shoot 1080p video at 30 frames per second, and capture still images of up to 12 megapixels. You can use it as both a webcam and a USB mass storage device, and even connect your smartphone using the SooCoo app. The battery life provided by the 1050mAh removable Li-ion cell is pleasantly surprising, providing around two hours of solid recording in our tests (expect less when you’re turning it on and off all the time). A smartphone connection provides a preview of your S60’s viewfinder, albeit with a few seconds’ worth of delay. You can start recording, take still photos, adjust camera settings and even download video and still images you’ve shot straight to your iPhone or Android device. The only drawback is that you’ll need to connect directly to the device using your iPhone’s Wi-Fi connection, though it all works as advertised. The S60 is a cheap weatherproof means of shooting high definition video, and given the right conditions you’ll be quite pleased with the footage. The camera comes with a decent selection of mounts to facilitate sticking the S60 on helmets, dashboards, handlebars and tripods. Easy access to removable batteries and storage means you can stock up on Li-ion cells and MicroSD cards before you head out too. There are also a few nifty features hidden away in the S60’s menu. These include cyclic recording, which splits your footage automatically into clips of two, five and ten minutes. It’s worth noting that the S60 only records clips of 30 minutes before creating a new file, so don’t expect hour-plus-long recordings. There’s also a motion detection recording mode, and the usual adjustments you’d expect to white balance and exposure value while recording video. In still photo mode you can get a little more hands on with the photo controls, and even shoot a time-lapse sequence using the in-built (but limited) functionality. Unfortunately the S60 has its fair share of flaws also. Aside from some build quality and footage issues, the LEDs on top of the unit cast an unsightly shadow as a result of their proximity to the lens barrel. In completely dark conditions these LEDs cast a “V” shaped beam of light, which won’t ruin your shot but will surely make you wish that SooCoo had put a little more thought into their placement. Lastly, the instruction manual is confusing and unhelpful. There are very few images and illustrations, and the instructions barely qualify as English. Nowhere does the manual specify which memory card (or maximum size) is to be used, and is littered with phrases like “as shown in below pictures” when no pictures are included. If you can live with the risk of less-than-stellar footage, slightly questionable build quality and you’re happy to explore and figure everything out without a manual to help, you might just get on with the S60. If you’re in the market for a budget action or dashboard camera 6 Ways To Use GoPro Cameras That Don't Involve Extreme Sports 6 Ways To Use GoPro Cameras That Don't Involve Extreme Sports GoPro cameras can be used in plenty of ways other than shooting extreme sports, six of which we'll be exploring in this article. Read More , you can comfortably save $300 on the price of the real deal and walk away from your next downhill trail with more than just memories and bruises. Then again if you really want to guarantee top quality footage and are buying a device that you want to last you, you should absolutely be considering the real deal in the form of a GoPro or one of its equally-pricey rivals. You simply can’t rely on the S60 in the same way, but that might not matter too much if you’re only looking for a grainy keepsake, or looking for an occasional use action cam. Explore more about: Digital Camera, MakeUseOf Giveaway, Sports. Looks like a great little action camera to product test. I'd love to put it through its paces, to its max. Figuring things out myself? Bring it on! Who says fun things can't come in tiny packages? I'd so enjoy one of these - oh yeah. Looks like a good alternative for times when you are unwilling to put a $$$ GoPro at risk, but still want good video. It seems to me a great product, I wish to rub my hands on. Holy Batman., . Wow, prize amazon gc is fab. & splendid. 2 fingers snap. It is tight, fly & off the chain. Thank you for the awesomeness, the contest, and generosity. :) Pick me, pick me! Your next winner!!! Show me the money!!! It would be a dream come true and means more to me than anyone else to win. Starving artist here desperately needs the prize GoPro to work and eat. Winner, winnner. Chicken dinner. A life changing experience. Top of my bucket list. Thank you for the awesomeness, the contest, and generosity. Dear Santa: I’ve been nice. My X-Mas wish this year is to win this contest. Nice giveaway. Thanks for the opportunity ???????? ?